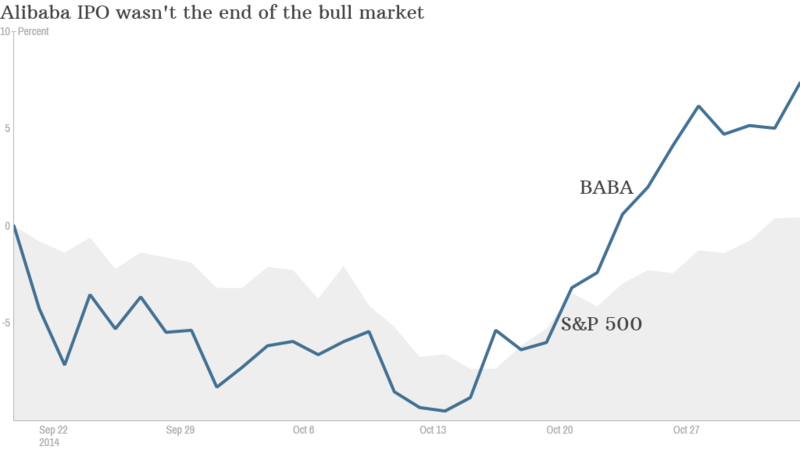 When stocks were tumbling a few weeks ago, some experts declared that Alibaba's initial public offering on September 19 might just have been the top for the bull market. Stocks have roared back to life on the back of solid earnings reports. The Dow & S&P 500 both hit all-time closing highs on Friday. And one of the stocks that is leading the way? Alibaba (BABA). The Chinese e-commerce giant's stock is up 7% from its first day closing price and more than 20% above its post-IPO low point. The stock rose 3% Monday to hit a new high. Thanks to Monday's rally, Alibaba is now worth more than Wal-Mart (WMT). Now it's time for Alibaba to prove to investors that its comeback and lofty valuation are justified. Tuesday morning the company will release its first earnings report since its IPO. Analysts are expecting earnings of about $970 million, or 44 cents a share, according to FactSet. That would be an increase of 20% from last year. Wall Street is forecasting that sales will grow 45% to $2.6 billion. Given how well the stock has done (keep in mind that shares surged 38% on their first day of trading) it seems safe to say that expectations are extremely high. Alibaba will likely need to beat earnings and revenue estimates to justify the stock price. Analysts will be particularly interested in seeing how strong Alibaba's mobile business is. Shares trade at about 45 times earnings forecasts for the current fiscal year that ends in March. Wall Street's consensus price target for Alibaba is $110.32, more than 10% higher than current levels. But the stock could blow by that quickly if the earnings report is strong. Alibaba, with a market value of $250 billion, is also worth more than American online retail giants eBay (EBAY) and Amazon (AMZN). The Alibaba-Amazon comparisons have been made incessantly since Alibaba filed to go public. Although the two companies don't really do the same thing (Alibaba does not hold inventory for example) there is one key similarity. Both are led by enigmatic men who have often been described as visionaries: Alibaba chairman Jack Ma and Amazon CEO Jeff Bezos. That can be a good thing. But not always. 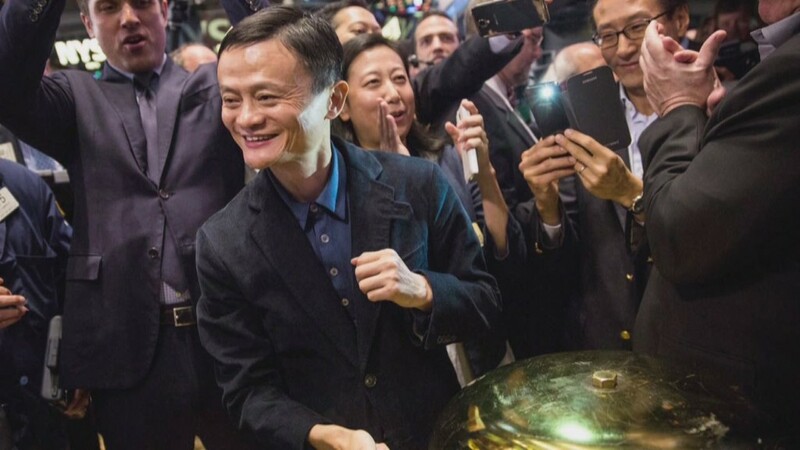 Jack Ma needs to be ready for the spotlight. 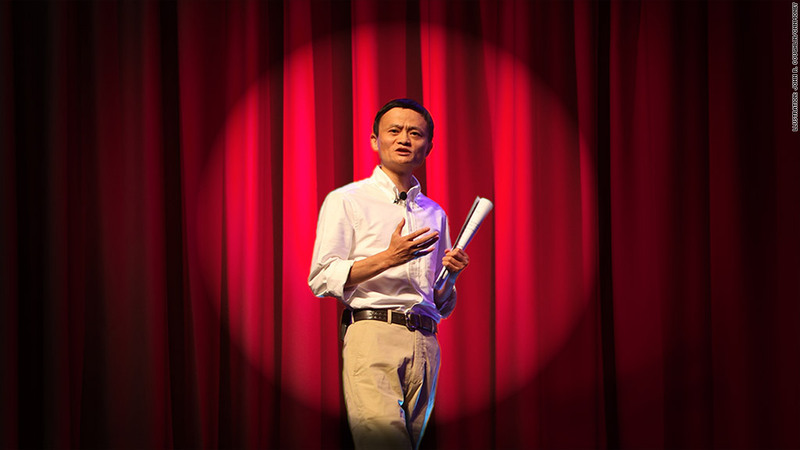 Alibaba is about to release its first earnings report since its IPO. Amazon has been a terrible stock this year as investors have grown tired of Bezos making investments that don't pay off in the near-term ... if it all. Wall Street does not seem to be concerned about Ma losing focus just yet. But with Ma talking about wanting to be a bigger player in the entertainment business, could that become a problem? There is speculation that Alibaba may look to make a massive investment in Hollywood studio Lionsgate (LGF), the company behind the "Hunger Games" and "Twilight" movie franchises. It also distributes TV hits such as AMC's (AMCX) "Mad Men" and "Orange is the New Black" for Netflix (NFLX). Some could argue that Alibaba needs to concentrate on its core business. While it is the dominant player right now, competition is increasing. JD.com (JD), another prominent Chinese e-commerce company that went public earlier this year, is also doing reasonably well. And it has the backing of Chinese social media giant Tencent (TCEHY). 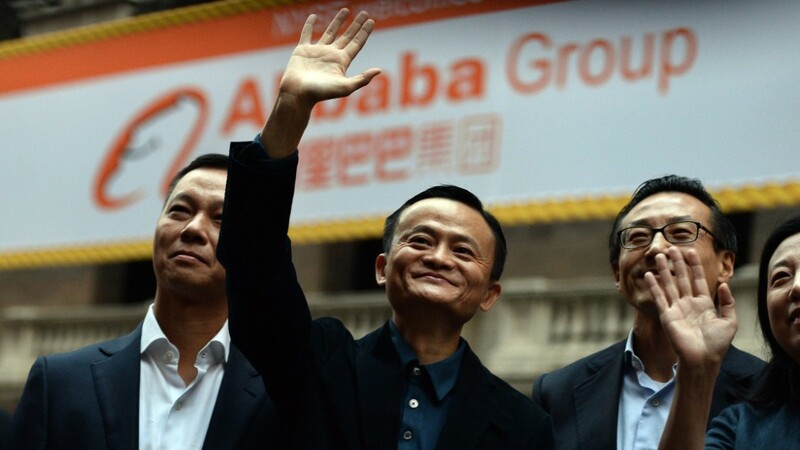 Some on Wall Street have very high expectations for Alibaba. Shareholder Morgan Creek Capital Management CEO Mark Yusko recently said at a Reuters event that he thinks Alibaba could be worth $250 a share in a few years. Yusko and other Alibaba bulls clearly are looking at the long-term horizon for China. Jefferies analyst Cynthia Meng, who initiated coverage on the stock last week, wrote that she expects more than half of Chinese consumers to be using Alibaba platforms such as Tmall and Taobao within the next ten years. That's up from just 25% now. So if Alibaba meets the hype, investors may need to start comparing it more to other titans of tech. Forget Amazon and eBay. Alibaba could get closer to catching up with Google (GOOGL) and Apple (AAPL) in market value.